Living trusts can potentially provide a solution to a number of legal and personal financial conundrums. They are a multi-use legal tool, and are continuing to increase in popularity. 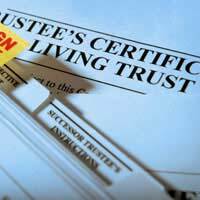 This article will give an outline of some of the major reasons that individuals continue to choose living trusts. Further information regarding the establishment of trusts for these purposes is available in articles elsewhere in this section. Perhaps the most commonly cited reason for establishing a living trust is the avoidance of probate. The probate process can be long, costly and difficult, and can sometimes result in the dependants of the deceased individual suffering severe financial hardship in the short term. Assets that are placed in a living trust, however, are considered separate from the remainder of the estate, and as such they are not required to go through the probate process. It should be remembered, however, that this is only the case for assets that are transferred into the trust during the lifetime of the settlor; assets transferred after the settlor’s death will be treated differently. Furthermore, transferring assets into the trust can be a time-consuming process in itself. An individual judgement must therefore be made on whether this effort is outweighed by the benefit to the dependants. Another particularly attractive function of a living trust is to provide peace of mind regarding assets in the event that the settlor becomes incapacitated or otherwise incapable of dealing with those assets. A living trust allows for the settlor to appoint successor trustees, who will assume responsibility for managing the trust if the original settlor-trustee becomes unable to do so. The appointment of a trusted family member or friend to this position ensures that an individual’s assets will always be dealt with in a satisfactory manner. Indeed, the trust need not even be funded during the lifetime of the settlor. Rather, it can be established as a safety net in case it is needed. This is particularly useful as it avoids the necessity for court applications for guardianship, which can also be a lengthy and difficult process. Asset protection is another significant benefit of a living trust. Some individuals use living trusts to mitigate the effects of bankruptcy. When bankruptcy is declared, creditors have almost free reign to take the bankrupt individual’s assets in order to recoup their loans. Assets transferred into a living trust, however, are no longer legally owned by the individual but rather by the trust itself. As a result, creditors are unlikely to be able to ‘attack’ these assets. Clearly there are a number of questions to be answered regarding the morality of this choice. A similar arrangement can also, however, be used to prevent claims being made by disinherited heirs or similar individuals after your death. While there are certain legal standards that must be followed with regard to the provision of assets for dependants, a living trust can be an effective means by which assets can be protected from individuals who may have a claim to your estate, either during your life or after your death. I would love to know the answer to the question posed by Stephen, namely, whether living trusts can be set up in UK and how it works. At the end of your post, you talk about asset protection offered by living trust. But it is my impression that a living trust in USA is generally revocable and thus not really offer much protection to those trust corpus. Only irrevocable living trusts can offer asset protection. Is this the same thing in UK? thanks for your time and await your answer.